Stop and think for a moment about the drinks you’ve had today, or this week (let’s stick with the non-alcoholic variety). You’ve probably chosen what to have and when; picked out a favourite mug, cup or glass; made drinks for yourself and for others; enjoyed a chat over a cup of tea or coffee. For me, the best drink of the day is the first cup of piping hot tea, in a mug of a size, material and design that pleases me, and I wake the rest of my household with their preferred drink. Everyday drinking – personal, sociable and, of course, essential for our health and wellbeing. When we go into hospitals or care homes, or are sick or frail at home, we lose so much of this. As nurses, we have a duty of care in supporting our patients in this most basic need, the need to stay hydrated. We also need to spot early signs that someone is becoming dehydrated so that we can intervene before their health is compromised. So far, so straightforward. Now for the bad news. Dehydration is a huge problem in our hospitals and care homes, generating headlines like “Thousands die of thirst and poor care in NHS”. It’s an expensive problem and the cost to our patients is preventable illness and death. Preventive efforts are falling short and the signs you think will tell you if someone is, or is becoming, dehydrated aren’t reliable. So you think you can spot dehydration? This is basic stuff, surely? It seems not. 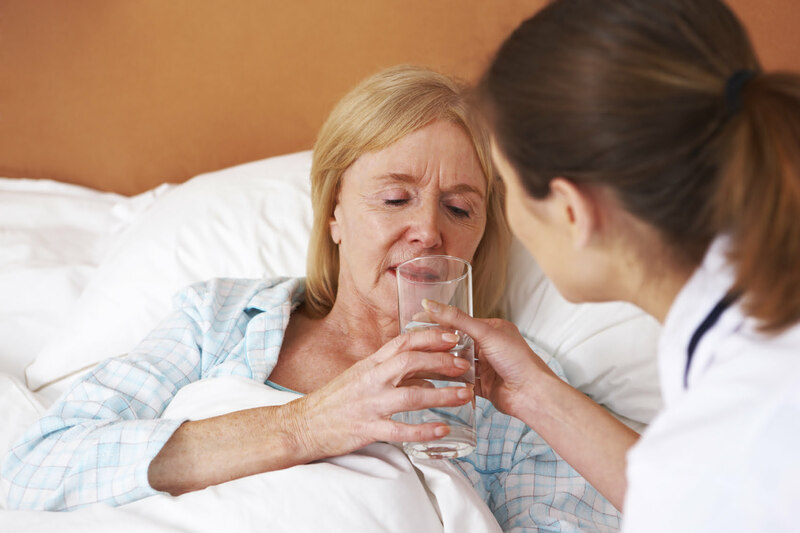 Checklists of early signs of dehydration, such as in this online learning unit for nurses, include thirst; dry mouth; darker, more concentrated urine; reduced concentration and headaches. As dehydration progresses the long list of signs includes reduced skin turgor, lethargy, reduced urine output, and in acute dehydration thread pulse, cold extremities and so on. Sound familiar? A recent Cochrane review explored whether simple indicators like dry mouth and urine colour are consistently useful in alerting us to dehydration. The focus was on people aged 65 and over. 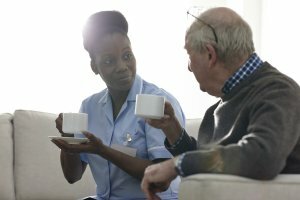 The evidence comes from three published studies and datasets from a further 21 studies, with participants from hospitals, care homes and living in the community. The reviewers assessed 67 tests, often at three cut-off points, and the diagnostic accuracy of each test was assessed against the best available reference standard for dehydration within each study. Of course, when assessing someone for signs of dehydration, you’re likely to be considering multiple signs and symptoms, not just one. The reviewers recognised this and hoped to address this in part by trying out potentially useful combinations of signs, which show some promising avenues for further research. They also highlight other areas of uncertainty that might be important, such as the timing of urine collection and testing. The reviewers also acknowledged that it’s not clear how generalisable the findings were that missing some drinks between meals and expressing fatigue may be useful tests for indicating impending dehydration. I’m guessing that, like me, you have very quickly thought of things that can complicate that picture, relating both to individuals (with cognitive and/or physical impediments to doing those things) and to their environment. The same goes, of course, for efforts to prevent dehydration. This was the topic for a lively @WeNurses tweetchat last night. As Heather Loveday (@loveebhc) pointed out, “If we get as far as dehydration we have failed, need to focus on hydration”. NICE guidance on improving the experience of care for people using adult NHS services highlights the need to “ensure that the patient’s nutrition and hydration are adequate at all times, if the patient is unable to manage this by themselves by providing regular food and fluid of adequate quantity and quality in an environment conducive to eating, placing food and drink where the patient can reach them easily, encouraging and helping the patient to eat and drink if needed and providing appropriate support, such as modified eating and/or drinking aids”. This isn’t always happening in practice, as reflected in our discussion. 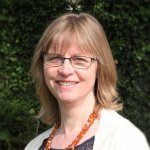 Factors working against people being well hydrated in hospitals and care homes include staff shortages, reluctance to drink because of fear of incontinence, drinks being unpalatable or left out of reach, dislike of plastic cups (patients have said it makes them feel like children) and difficulty with holding cups and glasses. People had a variety of suggestions for helping patients to be adequately hydrated included offering fluid in other guises (lollies, jellies, fruit); making drinks appetising (refresh water in jugs, offer it chilled, consider what people are being given to drink from); removing saucers (“have you tried holding a cup and saucer with a cannula in your hand? asked caterer Andy @mynameisAndyJ). Improving access to drinks in other ways was also suggested; enabling patients who can to refill their jugs and allowing visitors to make drinks. Finding out people’s preferences, and working with those, was acknowledged as being really important, as was remembering that drinking is often enjoyed in company – so we need to think about how to introduce a social element when we can. 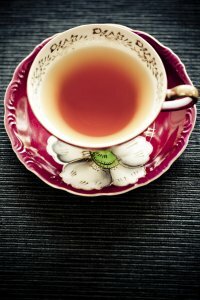 “Let’s start a cup of tea revolution … sit and have a cuppa with your patient” suggests Teresa @AgencyNurse. Join in the conversation on Twitter, where I tweet as @SarahChapman30 and also tweet for @ukcochranecentr, along with my colleague Jack. You may also be interested to read my blog for The RCN on Cochrane evidence on routes for parenteral rehydration, here. You can see details of the WeNurses chat and a full transcript here. Dehydration: do we really know how to spot it by Sarah Chapman is licensed under a Creative Commons Attribution-NoDerivatives 4.0 International License. Based on a work at http://onlinelibrary.wiley.com/doi/10.1002/14651858.CD009647.pub2/full.Images have been purchased from istock.com for Evidently Cochrane and may not be reproduced. Hooper L, Abdelhamid A, Attreed NJ, Campbell WW, Channell AM, Chassagne P, Culp KR, Fletcher SJ, Fortes MB, Fuller N, Gaspar PM, Gilbert DJ, Heathcote AC, Kafri MW, Kajii F, Lindner G, Mack GW, Mentes JC, Merlani P, Needham RA, Olde Rikkert MGM, Perren A, Powers J, Ranson SC, Ritz P, Rowat AM, Sjöstrand F, Smith AC, Stookey JJD, Stotts NA, Thomas DR, Vivanti A, Wakefield BJ, Waldréus N, Walsh NP, Ward S, Potter JF, Hunter P. Clinical symptoms, signs and tests for identification of impending and current water-loss dehydration in older people. Cochrane Database of Systematic Reviews 2015, Issue 4. Art. No. : CD009647. DOI: 10.1002/14651858.CD009647.pub2. The major (& for me, fatal) flaw in this review is the lack of an objective definition of ‘dehydration’. The authors refer to an external paper which in effect uses a clinical judgement definition. This makes the comparability between groups and the variances around groups impossible to be sure of. I use blood tests (urea, creatinine & Na) for my patients in hospital to decide if they are dehydrated. If all these are are within lab reference ranges, for practical purposes the patient cannot be dehydrated in the vast majority of circumstances. If this sort of objective definition had been used, we would have known what we were comparing, between the various groups and with the various tests. In the absence of this sort of gold standard, all the highly detailed re-analysis of the original papers’ data is virtually meaningless in my view. It is for this reason that I struggled for some time trying to make sense of the systematic review, and in the end gave up because I lost confidence in its basic premise.